I’ve been meaning to write a blog entry for ages now, especially after transcribing/editing the Pikes Peak  entry. What is this crazy world I’ve gotten into, after all? 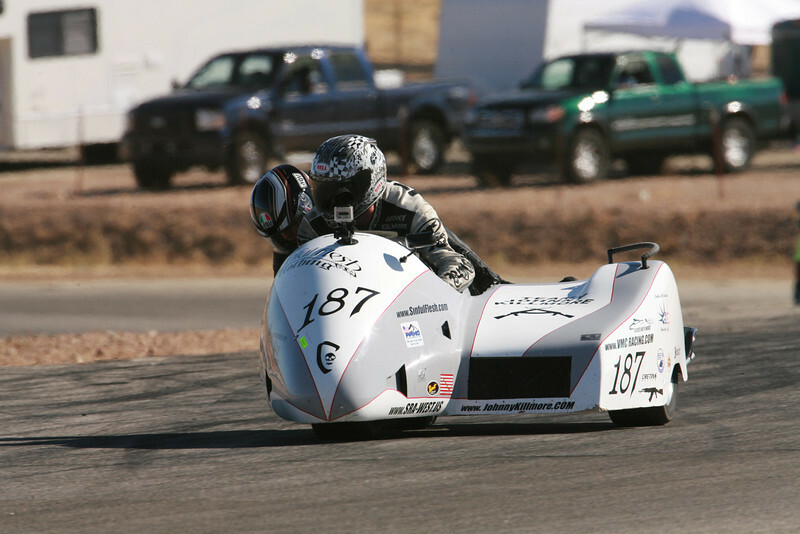 The Pikes Peak International Hill Climb in June 2010 was my first race ever, only preceded by a few “audition” laps on the Willow Springs main track in the April prior. Could it be that hard? I managed to stay on. I was unafraid. In fact, I was thrilled. Late, late, late [on transitions], of course, but who wouldn’t want to do this? This was something completely foreign to other things I had done up until this point, something I wanted to better understand. 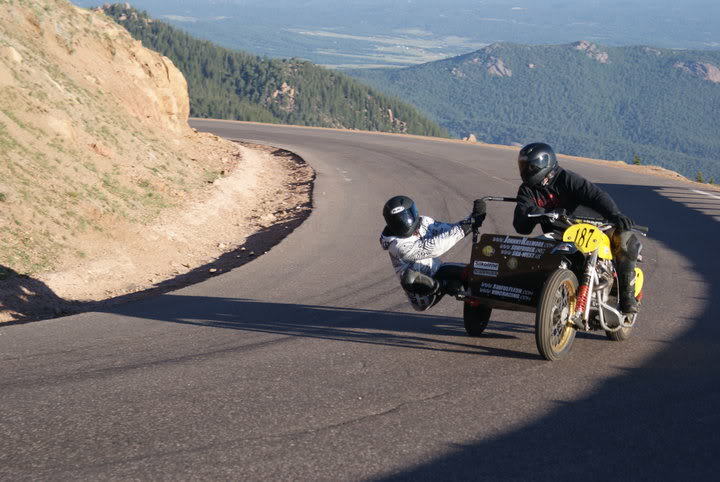 John and Gina during practice at Pikes Peak, 2010. Gina has less than 2hrs of actually on-bike time at this point, cumulative. Talk about throwing yourself right into things! Let me back up a few years (well, more than a few). I was raised in a computer age, probably using my first one around age 7. My first really functional computer was a 486. On that DOS and barely Windows piece of machinery, the few games I had were DOS-based. Horrible graphics, of course, but one in particular that I played pretty incessantly was an Indy 500 game. It would let you play with tire pressure, turning angles, and all sorts of things that made no sense to me, but man was it fun to blaze those bright, irregularly shifting colors on my teeny CRT monitor, speakers turned up and roaring with MIDI engine sounds. My fascination with vehicular video games never ceased, from the early car racing games (i.e., the first GT) to four-wheeling games. Not to say I was a “gamer,” but anytime I was around an arcade or at a friend’s house, my preferences were clear (besides, who needs a shooter-game when you go to the range already?). Ever try it in real-life? As often as my teenage confidence would let me: fast S-turns that got my truck on two wheels, topping out a V-6 engine at 113mph on my way home on the interstate, finding abandoned roads to push to my edge and find adrenaline-rush-fear, swimming-speeding my imaginary race line through traffic as if the cars were parked, playing games with much faster cars because I had heard in a movie once that it wasn’t what you drove that mattered but how you drove it. As I got older, I “grew out of it” and accepted that my racing dreams would only be dreams. Sometimes coming from Marin to San Fransisco through the Waldo tunnel, I imagine I’m in some sleek machine on an empty track and the pavement sings like silk in the wind, promising it could be true… similar feelings have struck me on the back of friends’ motorcycles going through the backroads of Marin near Mt. Tamalpais or on the Sunday morning ride to Pt. Reyes Station. Then, a text out of the blue from John [Wood], a guy I had met at a rock show in West Hollywood. Pikes Peak? Sidecar passenger? Sure. What are you even talking about? But yeah, sounds great! About 7 months later and a few thousand miles, I’m at about 14,000ft in race leathers: heaving-trying-to-catch-my-breath, can’t feel my arms from the vibration of the bike, grinning from ear to ear, so excited and happy that words are inadequate. John is a racer — it seemed like there were a hundred different things that were wrong about the bike, the timing, the speed, the line… me? After wrecking on the first day in a ditch, having to have a brake rotor replaced (which we had to find a welder for), both of us being new to the bike, and having barely a clue of what I was supposed to be doing or what it was supposed to feel like or even if I could actually complete roughly 12 miles, 5,000ft of elevation change, and 156 turns, that I was in one piece was the greatest victory of my life: pushed to the edge of what I believed possible of myself. 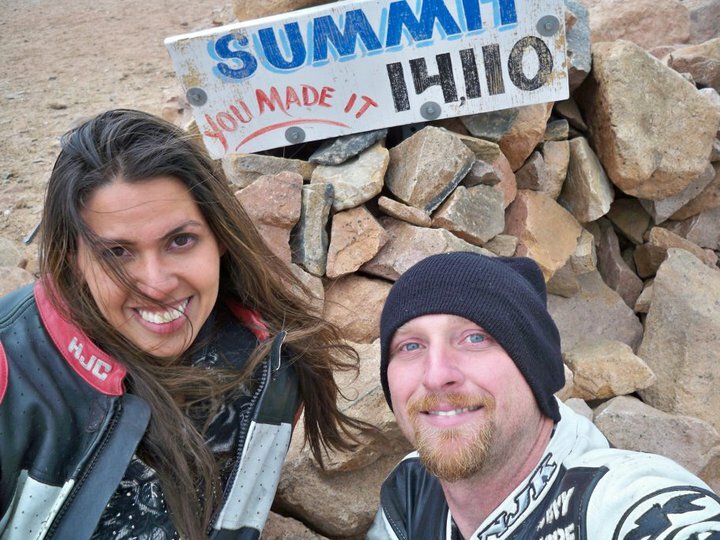 John and Gina at the Summit of Pikes Peak, 2010. Perhaps that was the novice in me, or as John has referenced, the hobbyist. A one-off or a not-so-serious competitor. And in all honesty, that’s what I thought it was. I never anticipated being asked to be a full-time passenger for a couple of reasons. First, John already had one. Second, it wasn’t something that came very easily, given I had no real racing background, and with no natural aptitude it seemed clear to me that John also viewed my debut as a one-off. When asked if I would sign on to the team, I was very surprised, though later less so given I wasn’t the only or even first choice. On reflection, this had little effect on my decision. I thought to myself, what do I want out of this? I have had to ask myself this question in many aspects of my life. Not a bad question to ask for just about everything. “For the hell of it” really isn’t good enough. And there it was: the peace at speed when everything goes right, like whatever exists is meant to be, the instantaneous perfection; the desire to be part of something that matters (even in a small sphere); to push myself in a way that I never had. There was only one answer. April’s race was difficult for me and frustrating for John; May was no better (climatically ending with me giving up the chair to Heidi for the race while I slept in my leathers miserably sick in the back of John’s van). For summer break I swore that I would train and instead got swamped with work and travel. September’s race I missed due to the death of a dear friend. And of course, there comes October: looming, threatening and unforgiving with two races on unfamiliar tracks wedged between multiple cross-country treks in my schedule. I had eaten chinese food with my roommate, fallen asleep on the couch, and woke to the opening scene of Face/Off. 2am race day. I watched the movie, packed, and made my way to the airport. A plane and a cab later, I was at the Las Vegas Speedway. Streets of Willow was much the same, driving 5 hours through the night after cocktails at my favorite bar in the mission of San Francisco. Singing to myself, I drove into the valley towards the track as the sun crept over the mountains early Saturday. All the studying I did of the track was for naught when I discovered the direction would be reversed. Learning the track while riding on it was the icing on the cake. Thus, Saturday practices were lackluster, but hanging out and having beer with friends after is a good salve for the worst days. Getting prepared for a race has become a routine of wrapping up mended, mending, and unmended battle scars. Tape, glue, wrap, ointment; ice in between practices. On the line after the warm-up lap, plan of action in place, I couldn’t feel any of them. I aimed to dig in and get more in tune with the movement of the bike as we tore down the front straight. Surviving the first 3 laps to push hard for the last 3 was something we had not tried before but it was worth a shot. In action at Streets of Willow, October 2011. Times? Fastest lap time for the team at that track. What? Malcolm Smith at Pikes Peak said smoother is faster. It seemed to be true with John smoothing out his lines to accommodate my size and movement, what feels slower is faster somehow. November is the last race of the year, back at a track that I haven’t seen since May. Is it luck or am I starting to get it? Only one way to know. Till then, what I do know is that on November 19th and 20th, there’s no place I would rather be.